I have been working on this non-stop and I am super happy with it! I walked around James St a week ago and took tons of photos (about 600) of all the buildings, crawling through the alleys and stopping lots of times for warm beverages. 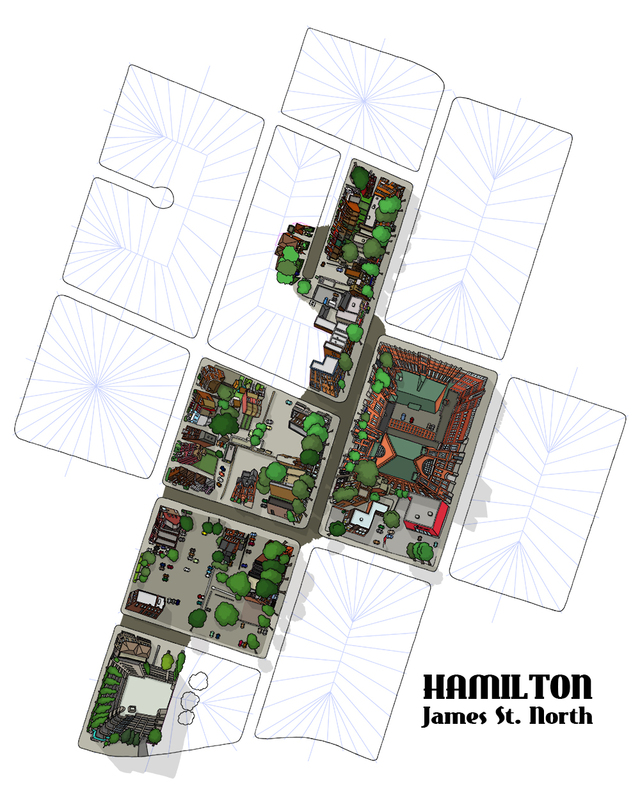 It was so much fun and really feel so much more comfortable with this section of Hamilton now! I've been working on the illustration almost every day, but it's DEFINITELY a labour of love. When I look at it I feel so happy but also kind of disbelieving that this many hours don't add up to a finished piece! It's a much larger map than the Roncesvalles ones, so I am making sure to include all the tiny details like window sills and air conditioners. You can click these images to see them slightly expanded if you like, I know it's hard to understand what's going on before it's complete. So that's why there haven't been many blog posts! I am busy busy! Also, I am back at my old job helping to train my replacement a couple days a week. It's been awesome to see people but the commute is exactly how I remembered it... terrible! Feedback is definitely welcome! Don't be shy just because it's a new blog!